Oakland Raiders linebacker Khalil Mack is reportedly seeking $65 million in guarantees in contract extension negotiations. Steve Wyche of NFL Network reported the news. A $65 million guarantee at signing would make Mack the highest-paid defensive player in NFL history. Ndamukong Suh currently holds the record at $59.9 million in guarantees, per Spotrac. 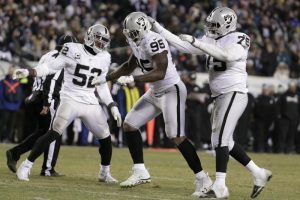 Mack is playing under his fifth-year option salary in 2018 and could be an unrestricted free agent next offseason. The Raiders would almost certainly use the franchise tag on him if they are unable to come to terms on a long-term contract extension.